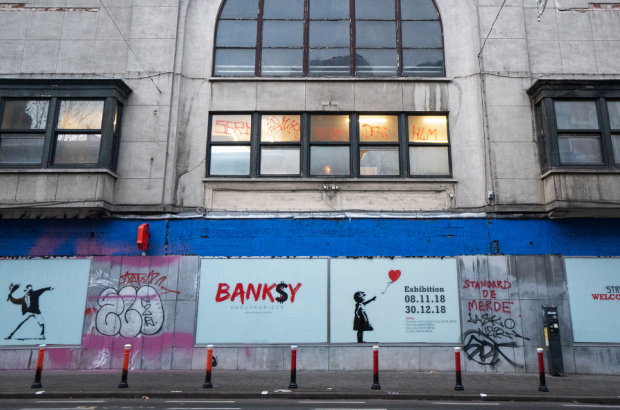 Authorities have confiscated some 60 works by British street artist Banksy that were part of an exhibition in Brussels. According to Strokar Inside, the organisation that manages the art space inside the old Delhaize Molière supermarket, the company that had lent them the works did not have permission to do so. The space in the former supermarket in Ixelles is a permanent home to street art, which can still be seen there. The temporary exhibition featuring more than 60 works by Banksy opened on 8 November. According to Strokar, a German firm called On Entertainment had arranged for the exhibition to come to Brussels. Apparently the firm did not have the permission of the owner of the works, Banksy’s former manager Steve Lazarides. According to Strokar’s lawyers, the works – valued at €15 million – are also not properly insured. The exhibition is apparently not the same as The Art of Banksy, with 80 works from private collectors that Lazarides has been exhibiting around the world. That exhibition was in Antwerp last year and opens in Miami next weekend. It is a show that is controversial, however. Lazarides and Banksy fell out a decade ago, and he is largely thought to be exploiting the work of the artist for major financial gain. It was Strokar itself that contacted the authorities and had the works taken into custody. It prefers to extract itself from the situation now and leave it to Lazarides and On Entertainment to sort out the legal problems.